Travel: There have been two trips, one to another United States and Colombia, which has been visited by distributors in these countries, and Manolo Exporting American exporting Winers in the U.S. and the company Manuelita in Colombia, which are responsible for distributing and publicize our products. Although the economic situation is not the best, we believe that following the line of quality, we can open new markets, to expand our wines. Award: Our wine Calderico Tempranillo 2012, has been awarded a gold medal at the XXIII edition of the competition organized by the Regulatory Council of the Denomination of La Mancha Orgien, 16-5-2013 in Acazar de San Juan. 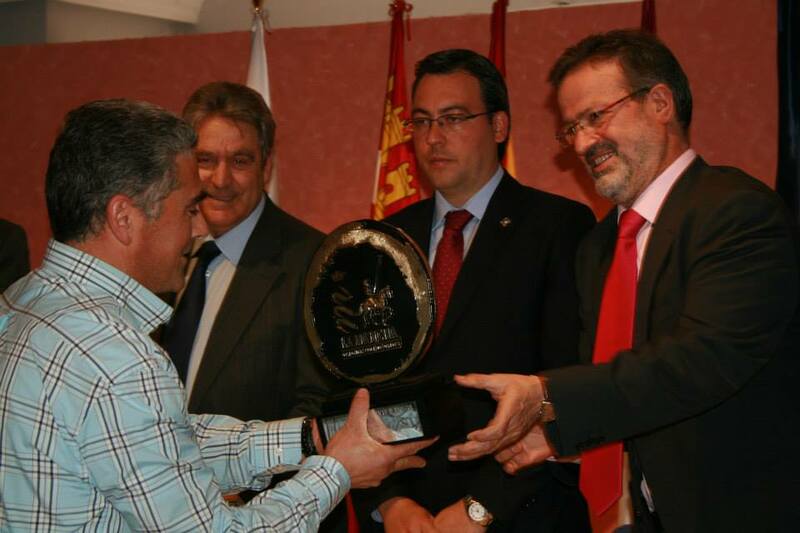 In the photo, our President D. Regino clerk, receives the award from the President of the Delegation of Ciudad Real Don Nemesio de Lara. sales@calderico.com © 2007 Bodegas Castillo de Consuegra. All rights reserved.